Vitamin K (Vit-K) is a fat soluble vitamin that is important for blood clotting and also contributes to a healthy heart, bones and teeth, brain, skin and immune system. There are several different forms of Vit-K, mainly Vitamin K1 (K1) and Vitamin K2 (K2), and they behave differently in the body. Vitamin K1 (phylloquinone) is natural form found in greens and nettle that is used by the liver for proper blood clotting. A small amount is used by the body. Some experts claim that 10% of Vitamin K1 from greens is used by the body. Vitamin K2 (menaquinone) is a more absorbable form of Vitamin K found in certain fermented foods and supplements. It is used by soft tissues and is helpful for bones, heart tissue and more. K2 is a product of the fermentation and is created by certain bacteria. 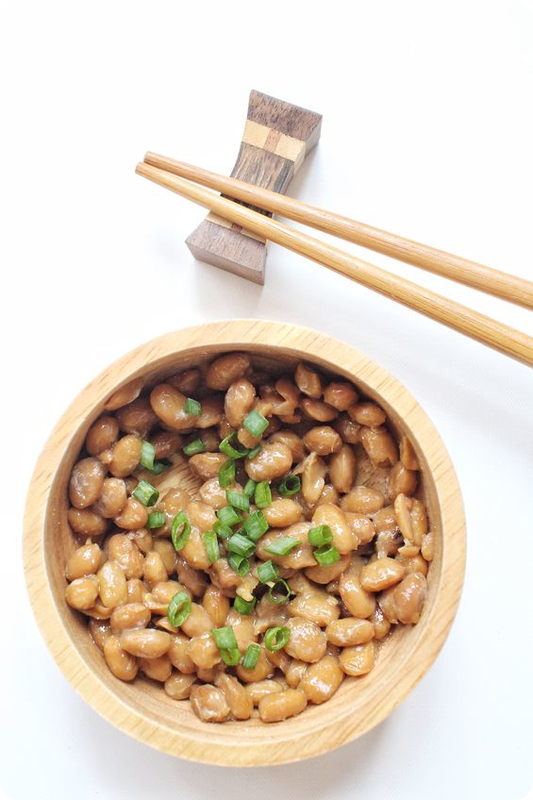 It is found in fermented raw grass fed dairy and certain other fermented foods like natto. These foods have more K1 than K2, however, greater amounts of K2 is absorbed in the body. Little K2 is usually consumed even in a healthy western diet. Studies have shown great health and cardiovascular benefits from K2. It supports bone development and helps the body store calcium properly. Some animals can effectively convert K1 to K2, however, humans need dietary sources of K2 to maintain good health. All the Vit-Ks are absorbed through the intestinal lining. First, the liver takes all the Vit-K it needs. Vit-K not needed by the liver goes to your blood, where it is distributed to other tissues including bones, muscles, brain, nerves and arteries. Our bones need osteocalcin to absorb calcium. Osteocalcin is released by osteoblasts (bone building cells) and binds to calcium. Osteocalcin requires K2 to become fully activated so that it can bind to calcium.3 Osteocalcin also stimulates the growth of new dentin, which makes your teeth stronger.4,5 Dr. Weston A. Price identified Vitamin K was one of the vitamins that is vital for tooth remineralization and the prevention of cavities. The same process that makes Vit-K helpful for preventing calcification of arteries and muscle tissue may also help protect the brain. Calcification can also occur in the brain, including the pineal gland, and create blockages in the blood pathways providing oxygen to the brain. The calcification of the pineal gland and reduced oxygen to the brain reduces cognitive abilities. K2 is also promising for skin health and anti-aging because it can help stop the accumulation of excess calcium in the skin. The excess calcium makes the skin less elastic. Skin cells release the matrix-GLA protein to prevent calcification of elastin in the skin. This protein is activated by K2. We can then conclude that K2 helps keep the skin elastic and prevent wrinkles. 2011 research showed that women with extensive wrinkles were also more likely to have low bone mass. Other research has shown that Japanese women were less likely to have wrinkles than other cultures.12 Note that nattō, which is fermented soy with high amounts of K2, is generally part of the diet of Japanese women. Gas6 is a Vit-K dependent protein which has been closely associated with the nervous system.16 Gas6 modulates microglia which are the primary immune effectors of the central nervous system and are at the core of tissue maintenance and repair. They accomplish important phagocytic functions, removing pathogens, cellular debris, and apoptotic cells that accumulate over time. In addition, microglial cells secrete cytotoxic substances such as cytokines and reactive oxygen species that they use to protect the brain from infectious organisms. Chronic inflammation is the source of many diseases, including cancer, obesity, and heart disease. Inflammation is also a crucial component of many chronic aging diseases. Evidence suggest Vit-K has an anti-inflammatory properties that is independent of its role as an enzyme co-factor.18 Vit-K dependent proteins and inflammation have been associated with cardiovascular disease and osteoarthritis, which are leading causes of disability and mortality in older adults. Vit-K has far reaching benefits in the body and without the help of other nutrients it can make significant contributions to holistic health. This meets our criteria for a worthwhile supplement and since it also works well with Vit-D we have combined them in the Zen Haus ADK Supplement. This simplifies supplementing strategies while also boosting efficacy. Learn more about the Vit-K and Vit-D synergies in the ADK Synergies post. 2) Kaneki, M. (2005). [Vitamin K2 as a protector of bone health and beyond]. Clinical Calcium, 15(4), 605-610. 3) Maresz, K. (2015). Proper Calcium Use: Vitamin K2 as a Promoter of Bone and Cardiovascular Health. Integrative Medicine: A Clinician’s Journal, 14(1), 34–39. 4) Thaweboon, S., Thaweboon, B., Choonharuangdej, S., Chunhabundit, P., Suppakpatana, P. (2005). Induction of type I collagen and osteocalcin in human dental pulp cells by retinoic acid. Southeast Asian Journal of Tropical Medicine, 36(4), 1066-1069. 8) Kaneki, M. (2005). [Vitamin K2 as a protector of bone health and beyond]. Clinical Calcium, 15(4), 605-610. 9) Flore, R., Ponziani, F.R., Di Rienzo, T.A., Zocco, M.A., Flex, A., Gerardino, L., …Gasbarrini, A. (2013). Something more to say about calcium homeostasis: the role of vitamin K2 in vascular calcification and osteoporosis. European Review for Medical and Pharmacological Sciences, 17(18), 2433-2440. 12) Vashi, N.A., Buainain De Castro Maymone, M., Kundu, R.V. (2016). Aging Differences in Ethnic Skin. The Journal of Clinical and Aesthetic Dermatology, 9(1), 31–38.